I’m slowly getting caught up on Flip 6. In real life, the transformation happened in two weeks. That’s the fastest I’ve ever finished a flip. It took several all-nighters and weekend shifts, but we got it done! Luckily for me, this auction house needed just a little bit of TLC. 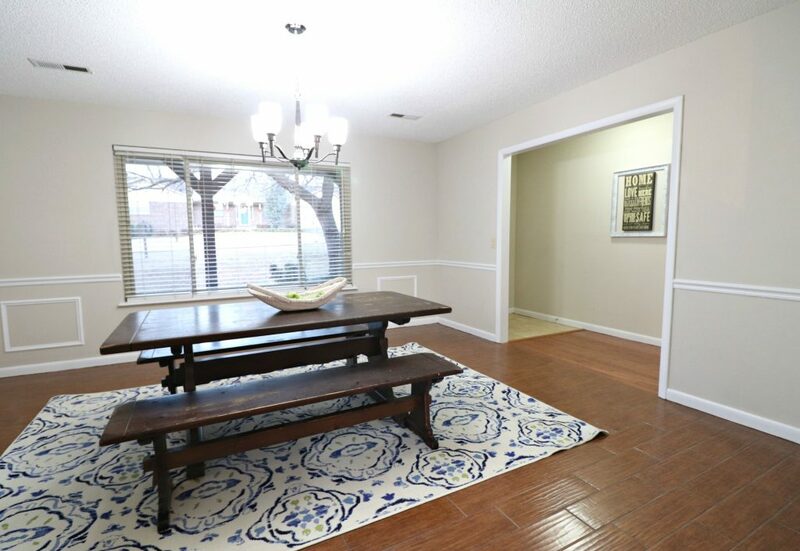 The dining room had really, really good bones. At some point, they had put in wood look tile, so I didn’t have to replace those. The broken fan was actually salvaged (the motor worked but the motor in the master bedroom didn’t, so we swapped it out), and I found a Craigs List light fixture for $15 to replace it. We added a fresh coat of paint and some premade moulding frames, and the room was done. I think we spent less than $50 total in this room! Can you believe it? As with the rest of the house, we used Edgecomb Gray on the walls, and used bright white for the trim. 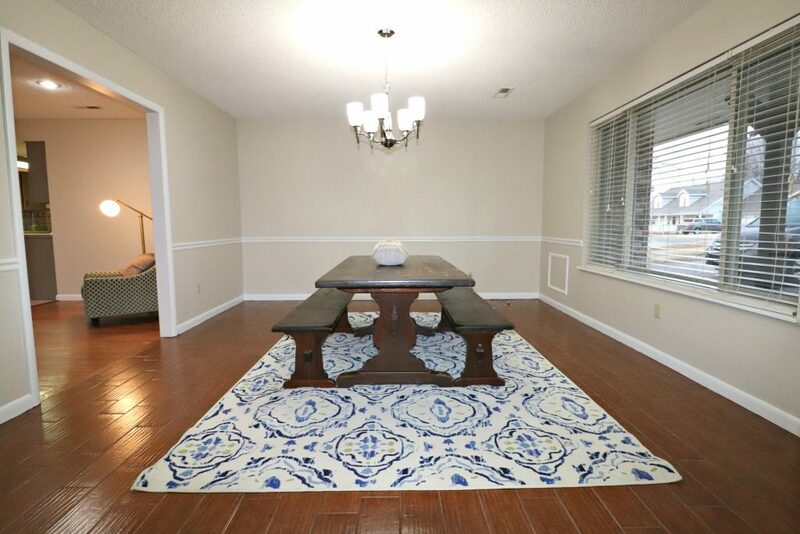 With some cleaning and staging, the room looks so much brighter and ready for family dinners! The premade picture mouldings are one of my favorite ways to add some character to a room. The chair rail was existing, and I thought adding some molding to accent the picture window would be a nice touch. They’re incredibly easy to install and very affordable! The living room in its original state really left a lot to be desired! It was so, so dirty, and the mustard yellow walls were just awful against the wood grain and dark brick fireplace. Again, this was such an easy, easy transformation. 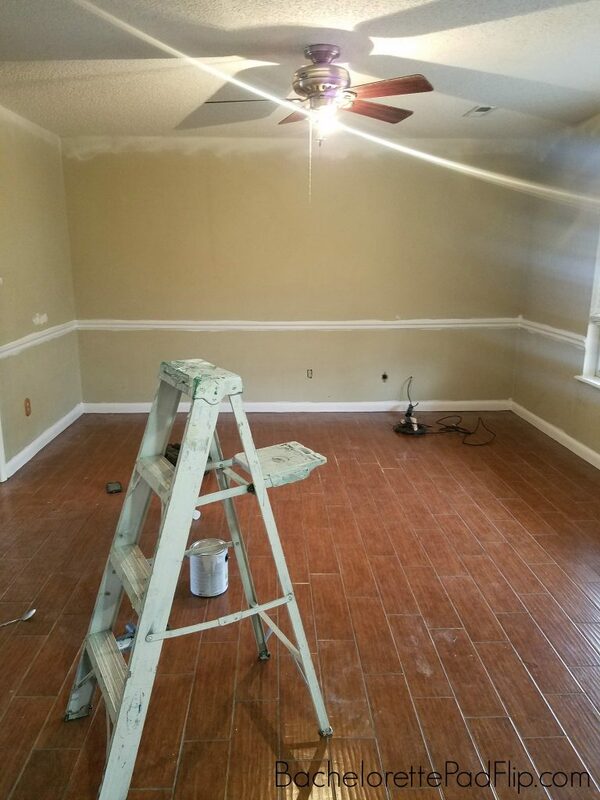 I obviously kept the original hardwood floors and the ceiling fan was filthy but working, so I gave it a good cleaning. 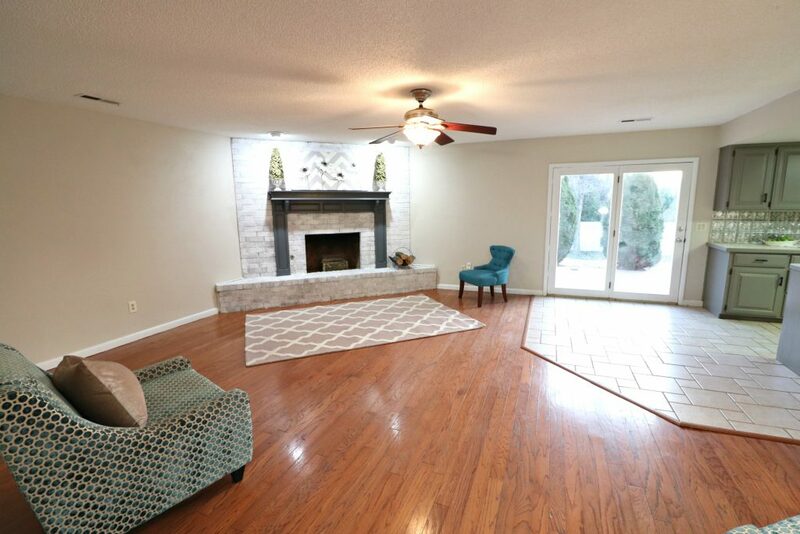 The only things that changed in this room, apart from getting rid of all of the trash, was painting the walls and the fireplace. 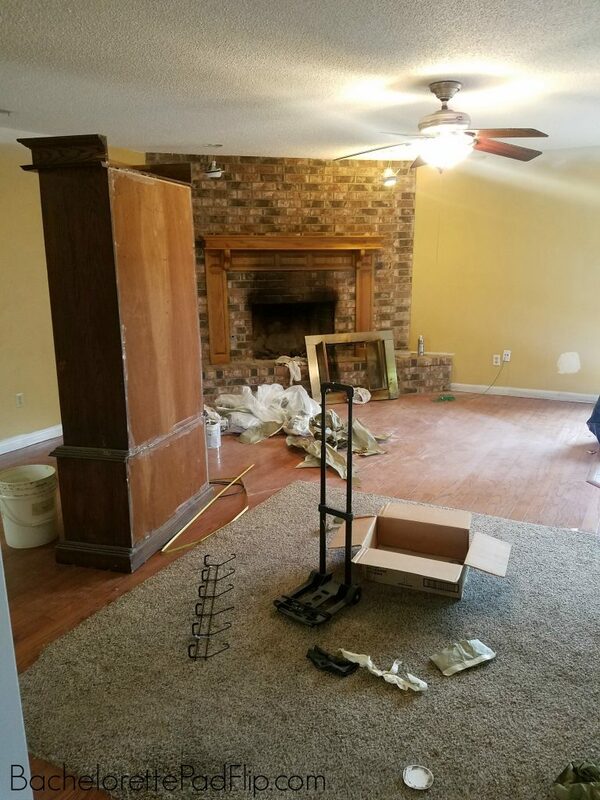 The fireplace was incredibly cheap to transform, and I had it done in a day. Before painting, I gave it a really good cleaning with a wire brush. Once it was clean and dry, I gave it a couple coats of whitewash. Whitewash is one of my favorite ways to update brick because you really can’t screw it up, and it’s so affordable! I found some leftover gray paint and gave the mantel a fresh coat of paint to tone down all the honey oak in the room. 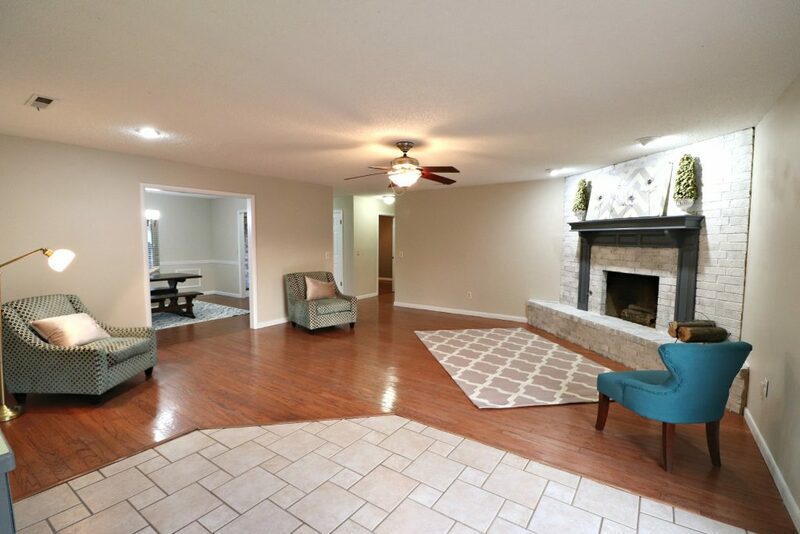 With a whole lot of cleaning, a little staging, and some paint, the living room transformed. 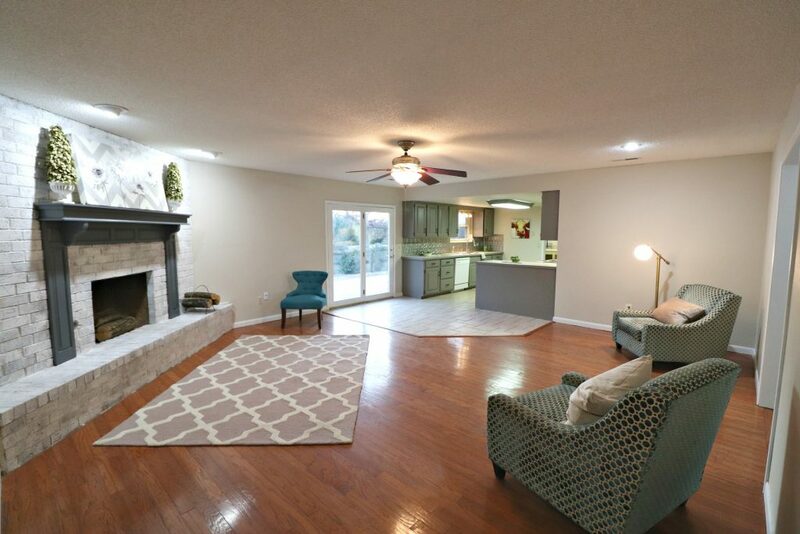 Flips don’t typically include just paint, so I know how much I lucked out with this flip- especially since it was an auction house! The Edgecomb Gray is a good neutral greige with warmer brown undertones that played well with the wood on the floors. I typically prefer a much cooler gray and less on beige side, but I think it worked well here. Flip 6 was my first time testing the waters of auction houses, and I couldn’t have been luckier. I fully realize that is the exception and not the rule. I will probably get burnt at some point with auction houses, but I’m happy to say that didn’t happen with Flip 6! The work was easy and the profit was good! Are you following me on Instagram? YOU SHOULD! I’ll be doing an Insta Live this Friday at 8pm CST to discuss all the numbers on Flip 6, tell you my profits from the flip, and answer your questions about real estate, investing, budgets, buying a house and everything in between! So come tune in with your questions! I really like that whitewashed brick. It lets the character of the brick show through, and the mantel in grey is real eyecatcher. A very pretty space. Thanks! I love whitewash too! You are amazing and I LOVE following along in your ‘adventures’. I just wish you would post more… I am living ‘vicariously’ through you. I love your style and all the things you do. You come up with some great ideas and then when you stag it looks so amazing with some great things. And I am all about ‘doing things cheap”. I would LOVE to be there on Friday…but I have NO idea how instagram works…I have tried going there to look up things for you or other things bloggers have suggested and ‘nope’….can not find / see what they are talking about. Thanks for your kind comments! I need to post more– I just get so busy! If you create an Instagram account, you should be able to follow along! I do have one….. but when I go there…all I see are pictures of what you have done. I click on them…and then I just get pictures of what you have done…..???? I don’t see anything else I can do on it. I am not a tecky person…but not ‘stupid’ either. I have ‘clicked’ on the little things all around and it does not take me anywhere…do anything… I MUST be missing something in the process…haha…. I guess my age must be showing…. I have tried to get around on Instagram…but I just don’t seem to have any luck to see anything but pictures….with wording besides them. Is there something that I MAY be NOT doing ? Instagram can be tricky! So when you open Instagram, your “feed” will show up. The feed is the posts from all the people you are following. Above their posts, you should see circles of people’s heads (weird, I know) and that means they have a story going on. You click on the head and it will play the story. If someone is live, the circle will have their head and say LIVE on the circle. Hope that helps! Thank you for helping me…so much appreciated that you take the time out to answer back…not many do.